Aladdin, the Disney film, has held a special place in the VHS collections of both the young and the young at heart since its release in 1992, and for that reason when a stage adaptation of the soaring, tumbling, freewheeling hit was announced, to premiere off-Broadway in 2011, expectations were sky high. Especially as Disney Theatrical Group's previous Broadway offerings had been a bit of a mixed bag (The Lion King is currently the 3rd longest running Broadway show of all time, whilst Tarzan ran for just over a year, a respectable run in its own right, but a rather short lived success comparatively). Thankfully, 7 years and multiple international productions later, Aladdin the Musical has proven itself to be a real diamond in the rough. The task of transforming a 90 minute animated film into a full length stage musical must have been a daunting one. After all, Disney pizazz aside, the story of Aladdin is fairly simple; in a fictional land named Agrabah a boy finds a magic lamp and the genie inside it grants him 3 wishes. However, book writer Chad Beguelin has expanded the story in several directions, notably giving the audience a better glimpse into the world of Princess Jasmine, the free spirited heir to the throne of Agrabah who falls in love with Aladdin when she ventures outside her palace walls for the first time. The sidekick role that Aladdin's pet monkey Abu filled in the film is picked up by his three new friends Babkak, Omar and Kassim, who are perhaps the most entertaining of the musical's new additions. They offer plenty of comedic hijinks and also perform one of the musical's catchiest new songs, High Adventure, as they rescue Aladdin from the clutches of the evil grand vizier Jafar. 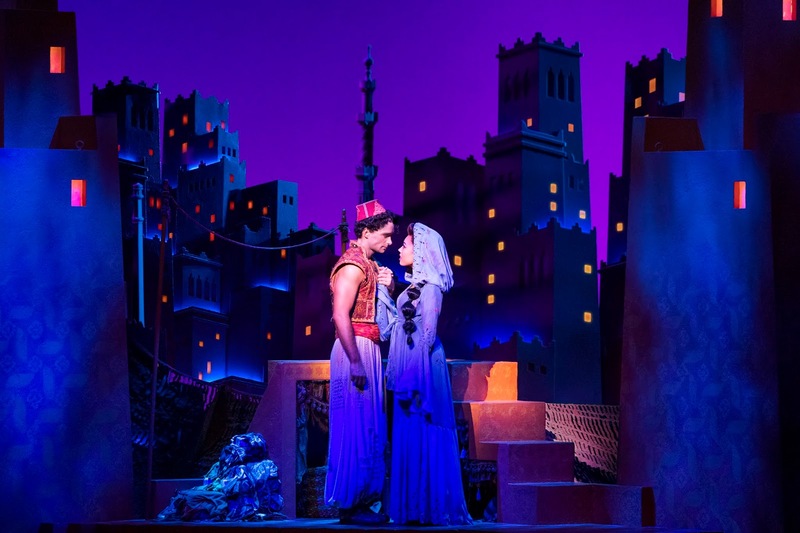 As with the original film, much of Aladdin the Musical's success relies on the titular character, a charmingly scrappy everyman. The West End production is in safe hands with the brilliant Antony Hewitt who plays the role at some performances and perfectly embodies the beloved Disney Prince. Smartly, Proud of Your Boy, a ballad written by Howard Ashman before his death, is reinstated having been excluded from the original film. 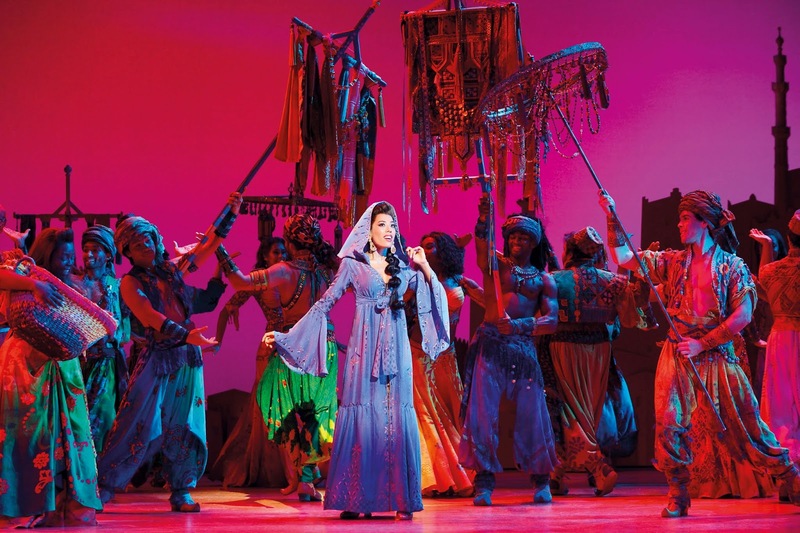 The song helps to give Aladdin a reason to strive for success and love, and is performed beautifully by Hewitt. Unfortunately, whilst many characters receive an upgrade to their characterisation, antagonist Jafar is relegated to panto baddie status at times, complete with front cloth scheming and an evil-laugh-off with his sidekick Iago. Admittedly the Jafar of the film is rather terrifying by Disney villain standards, but his stage adaptation is written a little bit too tamely and subsequently the story's climactic ending feels a little rushed and inconsequential, despite a rich performance by Fred Johanson. Conversely, the scene stealing genie, inspired by Robin William's iconic performance, elevates the already colourful and fast paced production to new heights, and Michael James Scott commands the spotlight expertly as excitable wish-granter. The musical features loads of grand spectacles, but few come close to matching the awesome magic of Never Had a Friend Like Me. The musical number features gleeful tap dancing (choreography by Casey Nicholaw is terrific throughout), mind boggling illusions, and all the vibrancy you'd expect from one of the most well-loved Disney songs of all time. The moment shines especially bright because it is so different from the sequence seen in the film, whilst maintaining its essence. Aladdin the Musical does adapts some of the film's moments so faithfully that they seem a little flat in comparison, but the new material and reinvented versions of the films most familiar scenes and songs ensure an overall sense of freshness and excitement. Another showstopping moment comes in the form of the magic carpet, the handiwork of master illusionist Jim Steinmeyer. 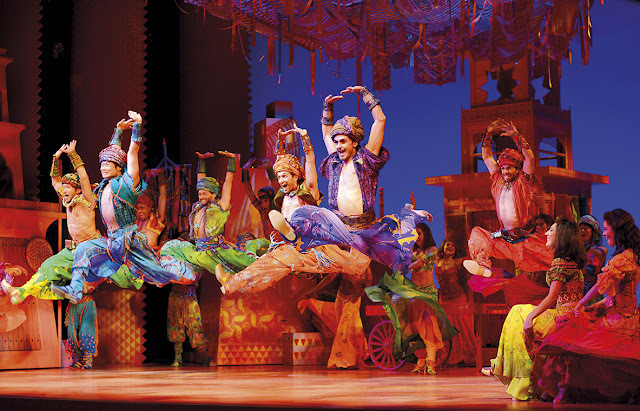 As it flies through the air, seemingly unaided, introducing Aladdin and Princess Jasmine to A Whole New World, the audience stares wide-eyed at the scene, transfixed by the gorgeous scene unfolding on stage, but also undoubtedly trying to spot a wire, or support beam, which might explain the fantastical textile's levitation. However the spell is managed, it is undoubtedly one that will live in audiences' memories long after the curtain falls. For young children, Aladdin the Musical will be a great introduction to the West End, and for those yearning to relive their childhood for a few hours, it will feed the nostalgia bug. It may not have shed the identity of its source material the way other Disney film stage adaptations have, but it's hard to imagine how anyone could resist the charm of this magic carpet ride!